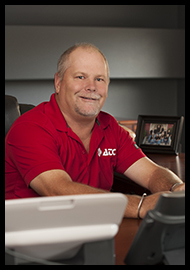 Rich Redman, Vice President and General Manager of ATC Communications, has been at the forefront of ATC’s operations for basically his entire adult life. His father, ODeen Redman, helped pioneer the company (along with his Grandma) back in 1929. Rich was literally raised in the Telecom industry, where he began following his father into work at the ripe age of 12. By the early 1990’s, he took a full-time management roll, and has been at the helm ever since. Rich has found sincere joy in providing his customers with the best service and technology available. In his free time, he enjoys ranching and farming his small acreage in Albion, as well as tweaking the settings of his new smart home and flying his drone. He’s a part time old-school country boy, part-time internet/technology junkie, and full-time community philanthropist. His infectious sense of humor combined with his down-to-earth mentality makes him the boss that everyone wishes they actually had. We’re honored to have this kind-hearted, New York steak lovin’ “Head Honcho” leading our ATC team.